The museum is open Thursday – Sunday from 9:30 am to 5:30 pm. We are closed from November to mid-April. There is a $5 admission fee to visit the museum. Children 12 and under, and museum members, receive free admission. Contact us to arrange a group visit. The West Virginia Railroad Museum is located in the historic Darden Mill in Elkins, West Virginia—a city that was built by the railroads. The Mill is on the corner of First Street and Railroad Avenue, two blocks south of the heart of downtown and the old railway depot. The Darden Mill was built in 1902, on land purchased from the West Virginia Central and Pittsburg Railway Company. It was a grain mill between 1902 and 1943, run first by the Elkins Milling Company then by the Darden Company. In the second half of the 20th century, it was a farm supply store, used furniture store, and a junk shop. The building is owned by C-HOPE (Citizens for Historical Opportunity, Preservation, and Education in Randolph County), who purchased and restored the building. 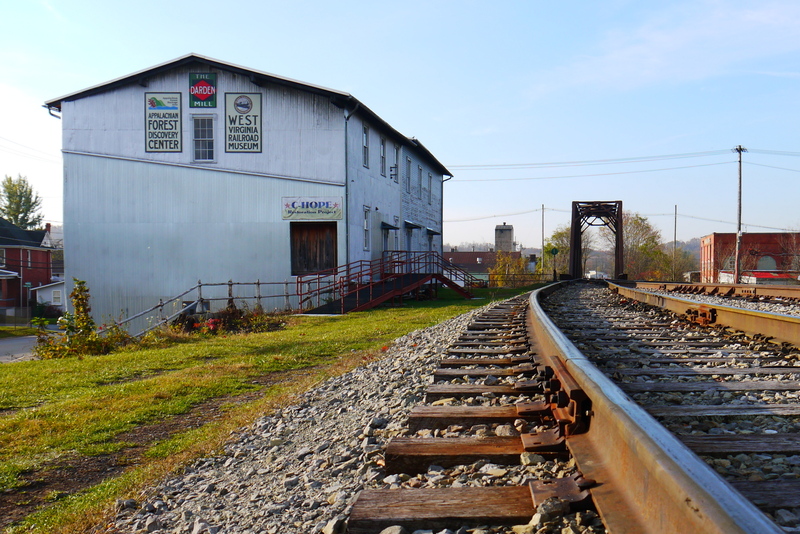 Located just blocks from the railroad depot and alongside the train tracks, the Darden Mill is the ideal location for the West Virginia Railroad Museum.The museum has limited parking, but free on-street parking is widely available in the downtown area. Want to see more of the Elkins area? Click the links below to see what else is out there.